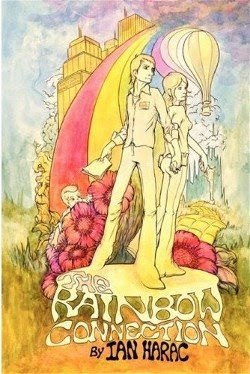 In a shameless bit of pimpery, I commend unto you my friend Ian "Lizard" Harac's new novella, The Rainbow Connection. I was privileged to hear this fanciful tale in its first incarnation as a short story at my SF writers group and it's teh AWESOME. Lizard takes the common spec-fic trope of alternate universes inspired by popular fiction and turns it on its head. The protagonist, FBI agent Matt Anders, is an anti-copyright-infringement investigator whose main job is stopping folks from importing stories from other universes that violate our only local timeline's copyrights. For example, while there are terrorists that want to bogart actual phasers from worlds where Captain Kirk was real, our hero's job is to intercept Trekkies who want to pirate in DVD copies of the original series' fourth season from a fan-fic universe where NBC never cancelled the show. Unfortunately, things go wrong when Anders stumbles upon the body of a dead munchkin, courtesy of the land of Oz. Insert an evil conspiracy, an ultra-geeky techno-pirate sidekick, and a talking broomstick, then allow bizarre hijinks to ensue. Seriously, you want this book, you need this book. And for local folks who want a signed copy, Lizard will be doling out the penstrokes at A Reader's Corner on Saturday, Mar. 7 from 1 to 3 pm, and he'll be attending my Watchmen Movie Premiere party later that same day so, should you arrive copy in hand, he'll be more than willing to put his fiendish John Hancock to the inside cover whilst we all boogie down. And if you're not local, I can probably still arrange for a signed copy, provided you're willing to pay shipping. Contact me for details. I have no energy, no time, and no ideas, but the crawling need in the back of my skull to create something is bubbling up again. I know this much: If I'm going to muster anything productive, I'm going to have to outline. This is not easy for me, mostly because I don't ever really do it. But I really won't be whole as a person until I tear some fiction out of the fetid depths of my soul and vomit it into a word processor file, whereupon I can gaze at its insignificance and insufficience. I'm in a happy place, can't you tell? As those that follow me on Twitter are aware, I've been having a minor sparring match with a certain state government bureaucracy this week. 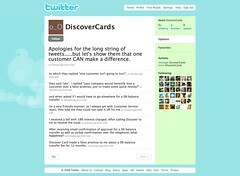 Some of it is my fault, but some of it is an example of how not to do customer service--unless Twitter has your back. Not to bore you with too many details, but I used an online form to request a certain service from the state. There were follow-up steps to this process that I screwed up, so I went back online to sort out the mess. Except there was no way to address filing errors online; the system requires that you call by phone or show up in person to a state office. So I call. And then I learn from the bureaucracy's voicemail system that it is this agency's policy to not answer the phone. Instead, the automated operator said I should sort out my issue online or, if that wasn't satisfactory, I could leave a message or dial zero for human assistance. Except that dialing zero just routed you back to the phone line that, by policy, they don't answer, bringing me back to the same operator-bot that told me to dial zero or leave a message. And, just for Catch-22's sake, the mailbox for this system was full, so I couldn't leave the requested message. Online says call; phone line says go online or leave a message, except that you can't leave a message. My only option at this point is to find a hole in my schedule--which wasn't until today--and go down there, delaying everything. So here's where Twitter comes in. It just so happens that two of my Twitter friends--unbeknownst to me--have secret inroads with this agency. One is an admin for the automated system I couldn't use properly, the other is a lawyer who had a friend in the bureaucracy that I could call. I had never met either of these guys in person, but they were willing and able to help me simply by virtue of our Twitter connection. All it took was me sharing my troubles via Twitter, and they jumped in. This, as they say, was awesome. The admin confirmed what I already knew; my filing attempt threw up a system error that only human intervention could sort out. He said that if I could get the right person on the phone, it could be sorted out. That, at least, was a relief to know that, while I had made the initial mistake, I wasn't completely insane for not being able to fix it myself. The lawyer's contact, however, was more helpful. She told me exactly what I did wrong, but, sadly, I would have to come down in person to sort it out. Again, this was helpful, if only because it stopped me from spinning my wheels with the phone system any longer. And the irony of it all? When I finally went down to the local agency office, all they did was give me a number for someone to call in the main state office in Frankfort. We spent ten minute son the phone sorting it out. If the agency Web site could have given me this phone number directly a few days ago, I could have saved everyone--myself especially--a lot of time and trouble. I'm not usually an ragingly anti-government guy, but experiences like this push me further down the Libertarian path--where I promise I'll be Twittering. Are you sure Michael Bay isn't directing this? No, that's right, it's the guy who did Van Helsing. Joe fans, you're screwed. I'll be the first to admit that the original Land of the Lost was trippy and weird and maybe not even good, but it deserved better than to be Anchormanned. The first Transformers live-action flick was stupid, but pretty. Based on this trailer, they tried to go dark, which is a really bad idea when you're bubble-gum dumb to begin with. You can't do Dark Knight without plot, and you really can't do Dark Knight with a giant robot made out of other robots that fights transforming robots. Thus, Optimus Prime gets pwned. Okay, so here's an idea, Hollywood. How about you stop mining my childhood for franchises you can remake into idiot movies! That can't be so hard, right?